Description: Each card has the letter in capital and lowercase basic italic with a helpful picture. 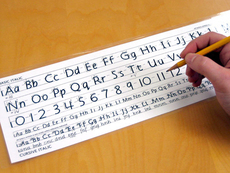 Use as an alphabet wall chart, flashcards or with word games! Also contains numerals. Cards comes in a single plastic box with a ribbon enclosure for easy storage. For Books A, B & C.